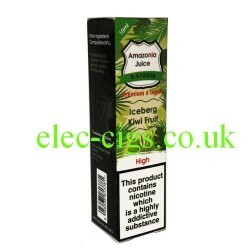 Amazonia 10 ML Iceberg Kiwi Flavour E-Liquid : They must be running out of flavours!! next it will be an iceberg lettuce: I thik the ice and the kiwi add a new and good depth to the flavour range and even though I joke about new flavours I think as long as they are as good as this then keep on keeping on. Amazonia 10 ML Iceberg Kiwi Flavour E-Liquid is just one of the flavours in this exciting range. It is available in four strengths which are: 3 mg (0.3%), 6 mg (0.6%), 12 mg (1.2%) and 18 mg (1.8%). It comes in a 10 ML plastic bottle with built in needle filler which is packed inside an attractive, product and nicotine strength dedicated, cardboard box. It can be used in all electronic smoking devices as it has the most popular 50-50 (VG/PG) mix. 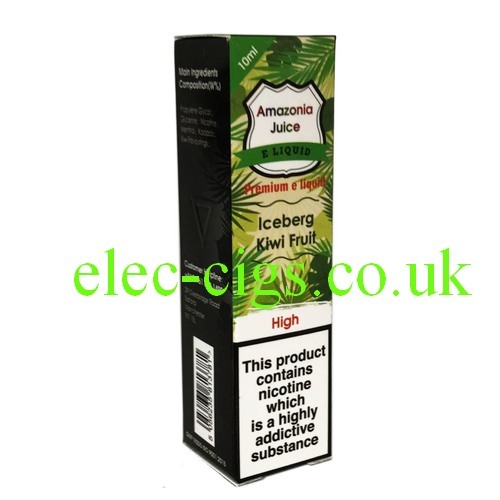 Amazonia 10 ML Iceberg Kiwi Flavour E-Liquid: This product is for sale to persons aged 18 years or older: by purchasing you confirm that you are of a legal age to buy this.